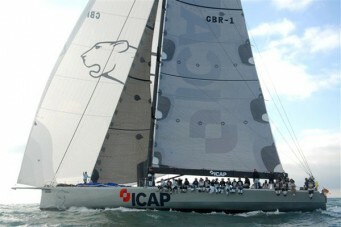 The 2007 LEOPARD 3 racing sailing yacht is a new concept for a 100ft super maxi from Farr Yacht Design. LEOPARD meets the demanding requirements of a luxury yacht capable of charter, a passage record breaker and a race winning super maxi. The yacht is 30 metres long, 6.8 metres wide, has a 5.5 metre draft, a 4.5 metre fixed bowsprit, one towering 47 metre mast and the keel cants 40 degrees either side of centreline. LEOPARD 3 features a relatively wide hull which is a direct successor to Farr Yacht Design’s successful Open 60, Volvo 70 and Cookson 50 designs. Accordingly, Farr Yacht Design has provided an ideal platform for exceptional speed with the volume for remarkable luxury yacht charters. LEOPARD 3 is a notable, and welcome, departure from the current mode of extremely narrow boats. Like the Volvo 70, the yacht’s wider hull concept is especially suited for high-speed sailing offshore. Interestingly her hull shape has been enhanced by the presence of a chine which improves water flow off the hull and reduces structural weight. LEOPARD 3’s sleek world class racing hull is appropriately matched to a collection of efficient underwater foils including a canting keel, twin asymmetric lifting canards forward and a single rudder on centerline aft. The stability boost added by canting the keel is equivalent to 200 crew members sitting on the rail, without the added weight! Her rig towers 154 feet above the water and can carry up to 15,000 square feet of sail area. The rig design is focused on providing the power and flexibility for the many modes of operation of Leopard 3. From competing for line honors in offshore races to thrilling charter outings the right amount of sail area can set quickly. The interior and deck are styled by Ken Freivokh Design. Designed and styled by 'Ken Freivokh Design' in Fareham, UK, the Leopard interior will be fitted out in an ultra light, airy and modern idiom. The interior is fully removable for competitive racing.